The first step is deciding what amount of power you computer needs. If you have had problems and need to replace the old one, you should probably buy one that is a little more powerful. I say this because if the old power supply fried, it could be because it wasn’t big enough or powerful enough for the computer you are running. It could also be a faulty equipment problem not all power supplies are made equal. So if you are replacing a 400 W power supply you might want to buy a 450 W or higher. Keep in mind that if you are just using your computer for surfing the web you probably don’t need the most powerful one that you can find, just one that is slightly more powerful than the one you are replacing. 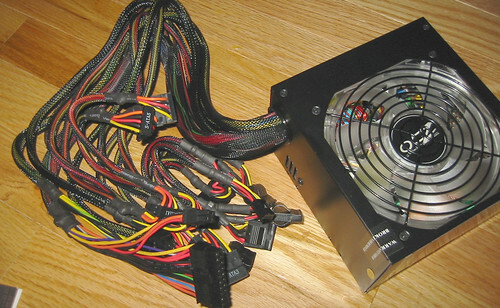 However, if you are playing a lot of high graphic games on the computer then you may want to go with a larger power supply. It just depends on what the computer is being used for. Once you have the new power supply and are ready to install it, you need to turn off the power to your tower. If the tower is in a cramped area where it is hard to work on it, you’ll need to move it out, this means unhooking everything from the back of the tower. Remember where they were attached so you can replace them when you are done. Next you need to open your tower case, depending on the case this could be removing a side panel, or the top panel, some open up like a book, again it just depends on the type of case you have. Make sure you ground yourself before touching anything inside the case; you can either buy an anti-static wrist band or keep touching the metal portion of the case. You need to do this to protect the electrical components inside the computer. Then remove the four mounting screws that hold the old power supply in place, and gently set this aside. Do not remove any of the connections from the old power supply yet. Place the new power supply in the case and secure it using the four screws you removed from the old power supply, and then using the old power supply as a guide move the connections one at a time to the new power supply. This saves a lot of confusion and ensures that you connect things in the correct place. Once you have everything connected to the new power supply you are ready to close up the case. Before you close it check to be sure that it is clean and dust free. Dust particles inside your computer case can settle on the motherboard and cause the circuits on the board to overheat. Reattach all your peripherals and power up the computer. When it turns on you may get a found new hardware message depending on the operating system you are using.